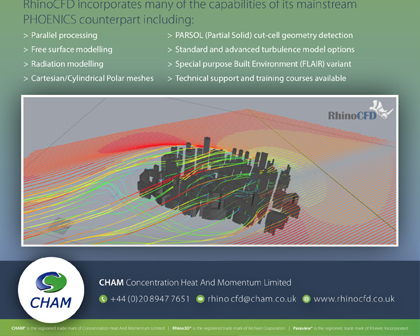 RhinoCFD, which is compatible with Rhino3D Versions 5 and 6, adds the power of computational fluid dynamics to the CAD environment. 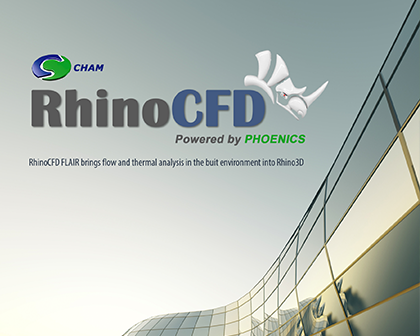 It allows Rhino3D users to undertake interactive CFD investigations of their CAD models operating under a multitude of flow conditions; and all without leaving the Rhinoceros environment. Email us at rhinoCFD@cham.co.uk to find out about prices and a free-trial option for students and academics.